Results of last week’s battle: Who did it better? Coury Palermo or Dolapdere Big Gang? This being Halloween week, how about something scary? No? OK, then how about something funny, quirky, and with a rabid cult following? For our double feature today, we’ll feature “Science Fiction Double Feature” (making this a quadruple feature?). First is Me First and the Gimme Gimmes with their punk take on the track, followed by Chris Murray and a lo-fi ska version of the tune. Oh, oh, I wanna know. Who did it better? I had to go with the Gimmie Gimmies. I was familiar with their version from the Rocy Horror Punk Rock Show CD as well as their own CD. If Chris Murray’s version was used over the credits I would have fallen asleep and missed the movie. I don’t expect anything new and interesting from the Glee versions. Unless someone else has done an interesting cover before that they can rip off. While I like covers by ‘Me First’, their shtick is wearing a bit thin to me… they basically do the same treatment to every song they cover. While I didn’t love Chris Murray’s voice, I really dug the arrangement and the new direction he took the song in. The lo-fi recording style suits the old school reggae feeling. As for Glee… ugh. Don’t get me started. On the bright side, I’ll be part of the team mounting a production of the Rocky Horror Show here in Cleveland next summer! Gonna be playing drums and creating some multimedia effects. Gonna be awesome. 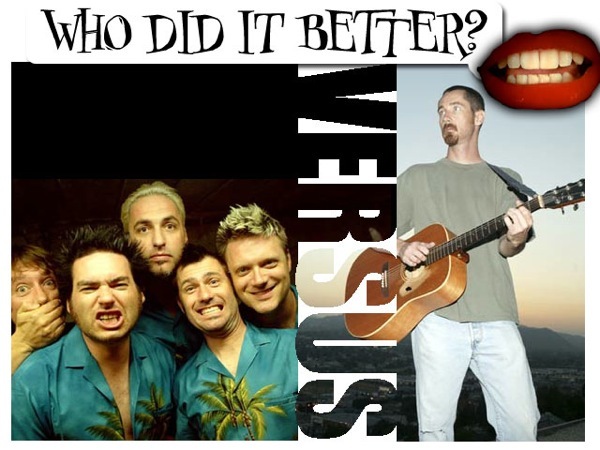 The original is still the best; however, in the spirit of “Who Did it Better?”, I went with the Me First & the Gimme Gimmes’ version. Glee – Rocky Horror – Thoughts? At least “Sweet Transvestite” was done in an interesting way. I wonder who did it that way first? I liked the energy of Me First & The Gimme Gimmes, but there’s gotta be someone out there who’s done it with a slower and little more schmaltzy feel. I had hopes for Chris Murray’s voice in that vein, but after the first few lines it was clear that he didn’t have any more texture in there, and that reggae beat felt really perfunctory and uninspired. The BEST cover was by The Forgotton Rebels. Puts all else to shame. Gimme Gimmes! C`mon guys. They are the best.